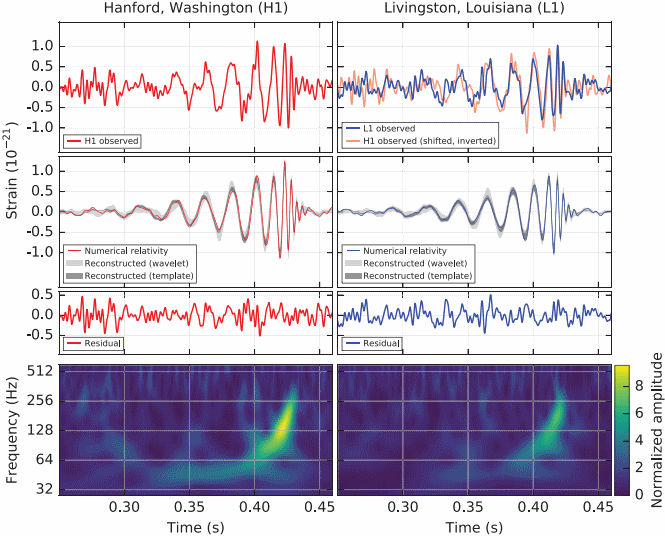 The plots depict an event that took place five months ago, on September 14, 2015, when the two observatories of the LIGO experiment simultaneously detected a signal typical of a black hole merger. The event is attributed to a merger of two black holes, 36 and 29 solar masses in size, respectively, approximately 410 Mpc from the Earth. 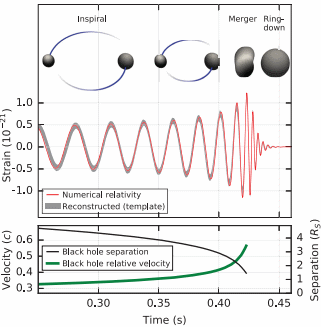 As the black holes approach each other, their relative velocity approaches the speed of light; after the merger, the resulting object settles down to a rotating Kerr black hole. When I first heard rumors about this discovery, I was a bit skeptical; black holes of this size (~30 solar masses) have never been observed before. However, I did not realize just how enormous the distance is between us and this event. In such a gigantic volume, it is far less outlandish for such an oddball pair of two very, very massive (but not supermassive!) black holes to exist. I also didn’t realize just how rapid this event was. I spoke with people previously who were studying the possibility of observing a signal, rising in amplitude and frequency, hours, days, perhaps even weeks before the event. But here, the entire event lasted no more than a quarter of a second. Bang! And something like three solar masses worth of mass-energy are emitted in the form of ripples in spacetime. The paper is now accepted for publication and every indication is that the group’s work was meticulous. Still, there were some high profile failures recently (OPERA’s faster-than-light neutrinos, BICEP2’s CMB polarization due to gravitational waves) so, as they say, extraordinary claims require extraordinary evidence; let’s see if this detection is followed by more, let’s see what others have to say who reanalyze the data. But if true, this means that the last great prediction of Einstein is now confirmed through direct observation (indirect observations have been around for about four decades, in the form of the change in the orbital period of close binary pulsars) and also, the last great observational confirmation of the standard model of fundamental physics (the standard model of particle physics plus gravity) is now “in the bag”, so to speak. All in all, a memorable day. The infamous 750 GeV resonance at the LHC How would a human experience gravitational waves?